Ugandan police have broken up a "mock birthday party" for President Yoweri Museveni held by opposition activists. 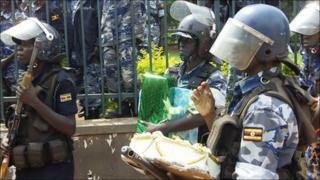 They declared the party in the capital, Kampala, illegal and confiscated a birthday cake and the presents. President Museveni's exact date of birth is not known. The government says he is 68 but the opposition says he is 73, which would make him too old to stand for re-election in 2016. He has been in power since 1986. The BBC's Joshua Mmali in Kampala says about 20 activists from the Free Uganda Now group arrived at the party singing and carrying nicely-wrapped gifts. They also had a cake iced with the words: "Happy Birthday Taata Muhoozi", meaning Happy Birthday Muhoozi's father - a reference to the president's son, who is commander of the Special Forces Unit, which includes the Presidential Guard Brigade. But the activists were outnumbered by about 200 policemen dressed in riot gear. The policemen chased away the activists with batons and walked away with the cake and gifts, our reporter says. Deputy Police spokesman Vincent Ssekate said police broke up the "mock party" because the organisers did not seek permission to hold it. "They failed to come out and tell us their intentions," he said. Mr Ssekate said the police were also concerned that it was taking place in the heart of Kampala's business district. "We could not risk people's businesses to allow such a gathering," he said. Brenda Nabukenya said the party was organised to inform Ugandans of Mr Museveni's age. "Through thorough research, we found out he is 73. We have gone to the schools where he went and also to his friends. They told us he is 73 years," she said. Our correspondent says there are no official celebrations to mark Mr Museveni's birthday. Under Uganda law, presidential candidates must be aged 75 or less. Our correspondent says there are no proper records in Uganda of when people were born, and it is difficult to verify the conflicting accounts. Mr Museveni was declared the winner of elections earlier this year but the opposition said they were rigged. Opposition activists then staged protests against the rising cost of living, which human rights activists said were brutally suppressed, leading to several deaths. Would Uganda's Museveni recognise his former self?